We were suffered to the max today, the first day without Kuang Myat, all of us - trainees were working hard so that the production line can going smooth. The best way to meed myself is to get a nice meal after the hardship so we went to the Passions of Kerala Banana Leaf Rice restaurant. When you read the banana leaf, you should know that I were trying up some Indian food today; this restaurant is located in Brown Garden, Gelugor, there have other outlets out there too. 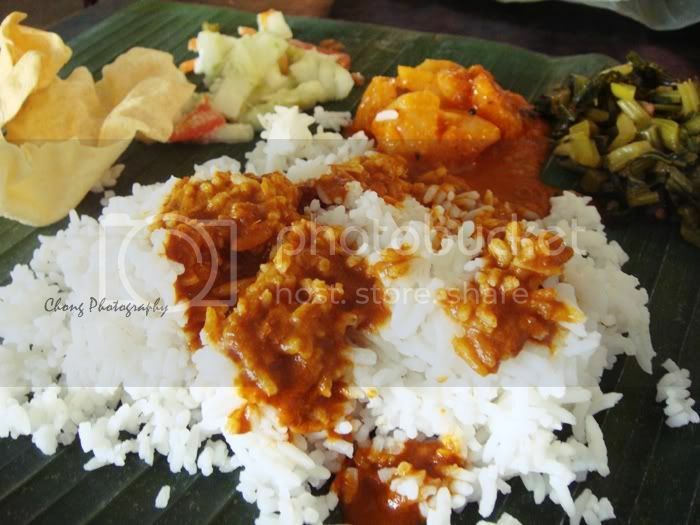 My banana leaf set, served with rice on a piece of banana leaf, with few vegetables and curry on top. We ordered some other dishes too, like fried squid, curry chicken, fried fish and mixed vegetables. The food is okay, the tasty spicy curry tackled my taste-buds a lot. We topped our dinner up with a glass of Mango Lassi, the taste of lassi is still up to standard with the average thickness and sweetness, yet the best Mango Lassi I had tried is at the Annalakshmi in the Temple of Fine Arts. At the moment I finished my dinner, I just realized that I should take more photos to show you guys, or you should try this yourself. Enjoy! Say Hi to the little kiddo first.